wow!!!! Caramel Pecan scent is awesome and 100% please and would highly recommend this candle to anyone thinking about buying it. Decadent scent that covers up the most pungent smells. Burn the midnight oil, then light this candle. It will provide an elegant look and even better smell. This candle lasted longer and burnt better than any other brands I have used in the past. I was able to burn the first one that I purchased all the way to the bottom of the jar, and it was a slow burner. I love the carmel pecan smell. Perfect for fall... made the entire first floor smell inviting. Really a nice product. I purchased the first one at a local store and loved it so much that I searched it out by name... that is really saying something for a candle. Not your ordinary candle! In the interest of full disclosure, let me begin by saying that I am a candy/comfort food/baked-goods candle junkie. So, candles that can make a room smell like something delicious is on the stove or in the oven are my hands-down favorites. Unfortunately, finding a candle that can actually do this is not easy and most are disappointingly light-scented to the point where you have to sit next to it to for the full effect or, even worse, they just don't smell like the thing they are supposed to represent. Not so with these OUR OWN CANDLE COMPANY mason jar candles. 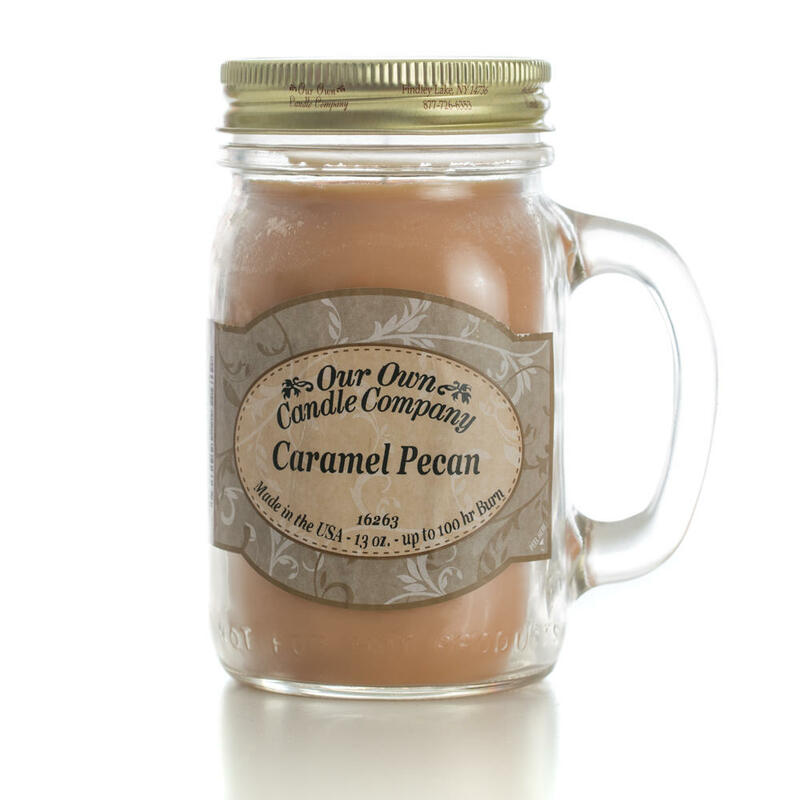 I have tried all of the following and, with the exception of the Hot Apple Pie (which IMO smells too sharp and needs something to make it smell more like the pie is in the oven), these candles are nothing less than awesome. The aromas are authentic and strong enough to spread around the room (or rooms depending on where you place it) without being overpowering: Root Beer Float (5-stars), Caramel Pecan (5-stars), Banana Split (5-stars), Apple Pie/Cinnamon/Vanilla (3.5-stars), Oatmeal Cookie (5-stars), Buttercream (5-stars), Chocolate Peppermint (5-stars), Smell My Nuts (5-stars), Hot Apple Pie (3-stars) I should also mention I'm not a big fan of mason jar candles, primarily because it's is difficult to find warmers/shades for these and that can make a big difference in how evenly the candle burns down in the jar (the company does have a shade available on their web site so I've ordered one to see if it works). I prefer the jars with a 3" mouth, especially the 14oz. size so I wish these folks would consider offering these wonderful scents in a different jar style. These candles have long, sturdy wicks, so you will want to trim the wick down to about an inch or so before lighting it the first time. As a precaution, let it burn for about 30 minutes outdoors or somewhere where soot won't be an issue, then let it cool and trim the wick to where it's no more than a half-inch above the wax. Like all jar candles, make sure you trim the wick before each use to prevent carbon soot. If you see soot coming off the candle after lighting, then the wick needs trimming. If you follow this little bit of maintenance, you shouldn't have any issues.